Should you buy this pint-sized toy piano for your kids? A superior toy piano that'll look great in any living room or nursery. You'll just have to decide if it's worth paying so much for something that your kids may outgrow in a year or two. Extremely cute. Looks and sounds great. Well built. Your kids will love it. Limited lifespan. Volume level isn't that high. Expensive for a toy. When it comes to miniaturised music technology, Korg has been leading the way over the past few years. Its nanoSeries range sparked a revolution in compact MIDI controller design, and the monotron made everyone realise that what they'd really been craving was a pocket-sized analogue synth. Even for Korg, though, the tinyPIANO represents something of a departure. 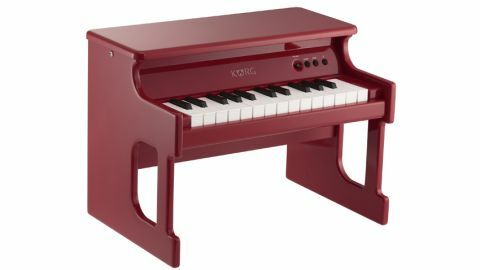 OK, it's already released a miniaturised grand in the shape of the microPIANO, but the tinyPIANO is a genuine toy (albeit a digital and very nice-looking one) and designed very much for young children rather than hipster adults. As such, it's incredibly simple. There are 25 mini keys that can be used to play any of the 25 built-in sounds. These range from the default toy piano patch to acoustic and electric pianos, organs, music boxes, bells and more. As you'd expect, these are a cut above what you'll hear on most toy keyboards, though whether their higher quality will be appreciated by a toddler is debatable. There are also 50 demo songs - child-friendly arrangements of classical and family favourites that, parents will be pleased to learn, are pretty soothing on the ear. Sounds and songs are selected in the same way: hold down the relevant button on the front panel, then tap a key on the keyboard (twice in the case of some of the songs) to choose a different one. There's no screen or labelling, so children will have to learn and remember where their favourites are, though there is a list of sounds and songs in the manual. Other features include transpose and octave shift, though these are accessed by a combination of key presses and probably aren't going to be called upon too often. The tinyPIANO can be battery powered or from the mains using an adapter (not supplied), and is available in four colour options (black, red, white or pink). This being an instrument designed for children, we're pleased to be able to report that it's extremely solid and feels like it's built to last (though the sleek finish may be prone to scratching over time). It's actually pretty heavy, and there's no chance of it being pushed over. However, as its name suggests, it is small - for kids aged between one and three it's probably about perfect, but as your offspring get older they'll have to contort themselves to get down to the level of the keyboard. Furthermore, the volume level, even at its maximum setting, isn't all that high. Again, this might please parents, but if you have a couple of children playing together, their noise might easily drown out the piano's. There is a mini-jack connector that gives you a mono audio output, but connecting the tinyPIANO up to a set of speakers sort of defeats the point of it being a small, self-contained instrument. That said, our child testers (aged 3 and 6) had great fun with the tinyPIANO, quickly grasping how to change sounds and songs and enjoying exploring the different sounds it can make. Our reservations have nothing to do with its quality - which is excellent - but rather its longevity, which may be limited due to the instrument's small size and lack of flexibility. This may be a toy, but at £200 it's a pretty expensive one, and you're entitled to think twice before investing in something that might only last you a couple of years. The other argument, though, is that if your kids enjoy the tinyPIANO and it inspires a love of music and a desire to play a larger keyboard as they get older, it's done its job.